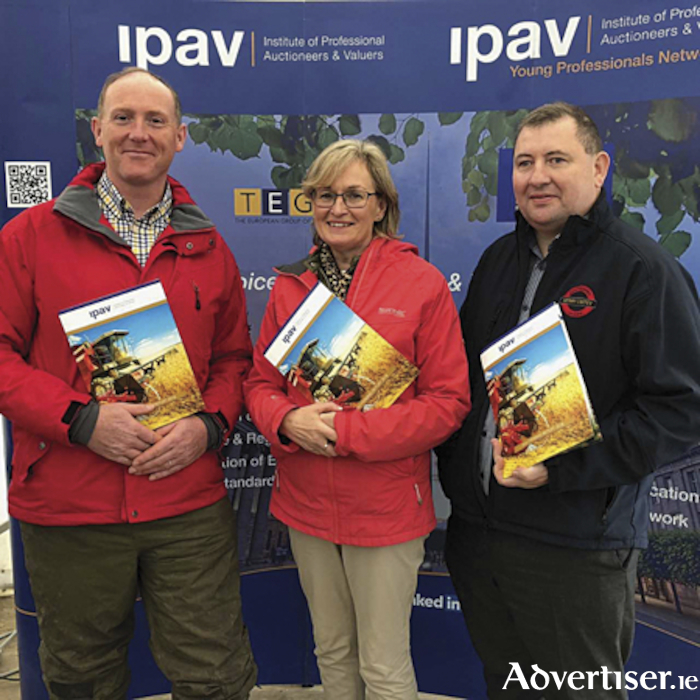 Launching the IPAV Farming Report 2018 were, Mairead McGuinness MEP and first Vice-President of the European Parliament, pictured with David McDonnell, IPAV Senior Vice-President (left) and Gerry Coffey of IPAV’s Agricultural Committee. These are the key findings emerging from the latest farming report from IPAV, the Institute of Professional Auctioneers & Valuers which was launched at the Ploughing Championships by Mairead McGuinness, MEP and first Vice-President of the European Parliament. This current period of stability in land prices was preceded by downward pressure on values in 2016 (-3 percent ), followed by a general stagnation in 2017 (+1 percent ). One of the key factors affecting sentiment and confidence in 2018 to date has been the inclement weather, the report says. Following three years of good growth with typical weather patterns, matters became challenging in 2017 with extensive flooding followed by snow in late February 2018, and an extensive period of drought in June 2018 and the first half of July. Moisture levels on a national level were down 15 percent on average in 2018, with some areas in the south & south east reduced as much as 40 percent. This lack of growth in the summer months in turn, has had a significant knock-on effect on the volume of the harvest to date, with the worst affected areas experiencing falls in yield of up 35 percent, the report notes. Launching the IPAV Farming Report 2018, MEP McGuinness said when it came to the 2017-2018 period Irish farming, while not alone among its European neighbours, has experienced an unprecedented set of challenges that demand both short and long-term interventions. “Among the immediate challenges are the supply of winter fodder and its associated input costs. It marks a double whammy when yields are down and input costs are, as a consequence, significantly up,” she said. Pat Davitt Chief Executive of IPAV said land value is often a key indicator to the sentiment or health of the prevailing agricultural sector. “As if the severe drought has not been enough of a challenge the uncertainty and worry that Brexit brings is being felt, and particularly so along the border counties where sales activity and investment has slowed considerably,” Mr. Davitt commented.